Just last week, San Francisco 49ers quarterback Colin Kaepernick was fined $10,000 by the NFL for wearing a pair of Beats brand headphones during a press conference after the team’s win over the Chiefs. The fine was the first of its kind after a ban was placed on the product; the NFL has a deal with BOSE systems, and for the most part, players are required to either wear that brand of headphones, or none at all. 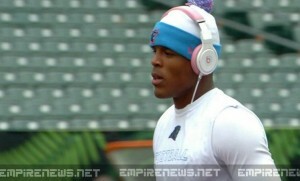 Yesterday, Carolina Panthers quarterback Cam Newton was also photographed wearing Beats by Dre headphones, apparently not giving one second thought to the fact that he, too, could end up fined the equivalent of what amounts to half of the annual salary of many of his fans.